Capital S.M.A.R.T has joined AA Insurance's repairer network in Auckland, New Zealand to deliver high quality small to medium collision repairs within industry leading timeframes. 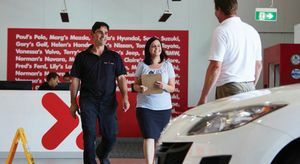 AA Insurance Head of Customer Relations, Suzanne Wolton said it was a great initiative for customers in Auckland, as it would help to get them back on the road sooner. "We need to increase our repair capacity as last year a significant amount of work went to repairers outside our Quality Repairer Network. S.M.A.R.T works on a limited type of repairs so is a perfect fit to complement our existing suppliers and with the increased volume of repairs it makes sense to add them to our network," said Suzanne. Chief Operating Officer (& S.M.A.R.T Founder), Jim Vais said S.M.A.R.T was looking forward to working with AA Insurance and bringing its innovative technology and systems to New Zealand. "Our end to end processes and innovative production methods are designed to ensure industry leading repair times with high quality and safe repairs backed by AA Insurance's Lifetime Repair Guarantee". S.M.A.R.T will work through 2014 developing the solution for the Auckland repair centre. Chief Executive, Norman Moss said the arrangement with AA Insurance was an exciting phase of development for the company and a testimony to the people in S.M.A.R.T who had played a pivotal role in the evolution of the business and its network over the last four years. "We have revolutionised the collision repair industry by focusing on customer service. Not only are the majority of repairs completed on a "Next Day" basis, but we are in contact with our customers during the repair process through our digital platform Key2Key™."